What is a ladder rack? 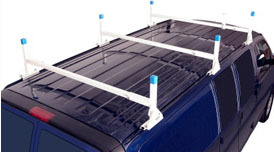 A ladder rack attaches to the roof of your cargo van for storage and secure transportation of your ladder(s). 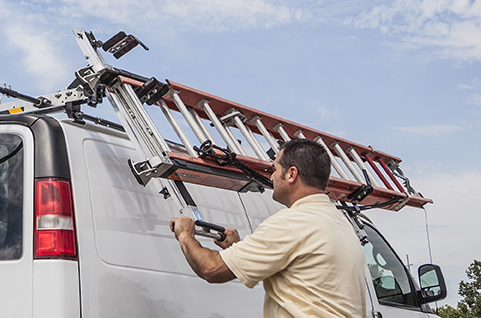 If you use your ladder on a regular basis, you understand how important it is to have a reliable ladder rack that you can trust to keep your ladder safe on the road and on the job. Learn more about the benefits of ladder racks. What are my ladder rack options for cargo vans? Adrian Steel ladder racks are designed with ergonomics and user safety in mind. Whether you’re upfitting a single van or an entire enterprise fleet, Adrian Steel has just what you’re looking for! 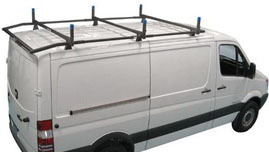 Take a look at our ladder rack models for cargo vans below. The Drop-Down is very easy to raise and lower. 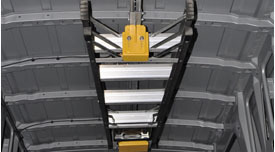 The unique ladder rack brings your ladder to a comfortable working height by positioning the ladder diagonally. The GripLock firmly grips ladder rungs to prevent slipping and shifting during transport, which cuts down the risk of potential injury and damage. The most versatile option on the market, utility racks make the transportation of cargo, including ladders, simple and efficient. 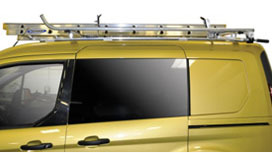 Designed for full sized vans, perimeter racks are gutter-mounted and require no drilling to install. These racks also include a slant-down rear section for easy unloading and rope hooks for easy tie-down. The Ladder Keeper mounts your ladder to the ceiling of your van, which keepsit securely inside and safe from the elements. Not sure where to start? Check out some of the most important things to think about when shopping for a ladder rack.